One of my bloggy friends has been participating in a meme called Friday Fragments hosted by the Unknown Mami. I thought I would invite myself to play along because I’m a joiner like that. Basically it’s a bunch of random thoughts all bundled into one post. I have a LOT of random thoughts, just ask Shaun. Another thing I didn’t understand was Rainer Cherries. They were sooo spendy and they weren’t even the right color! Who ever heard of a yellow cherry? Eventually I was convinced to try one. It was love at first bite. Now I eagerly look forward to the cherry sellers alongside the road every year. YUM! I always think of my Aunt Mary at cherry time. We were in Michigan several years ago for a family reunion. For some reason or another, Aunt Mary was boasting that Traverse City was the Cherry Capital of the world. she said that everyone knew that the best cherries came from Michigan. Then she happened to look down at the container that the cherries we were gobbling up came in. I still laugh when I think of how baffled she was when she read that those delicious cherries had been grown in Wenatchee, WA. I say “Cherry Time” because fresh cherries have a very short season. It’s so sad. One of the best parts of eating cherries is spitting out the pit. Well at least for most people. I’m pretty awful at spitting things I’m going to blame it on the fact that I can’t roll my tongue. Which is genetic. Therefore, it is not my fault that I can’t spit pits beyond my chin. That’s enough random thoughts about cherries. I think I’ll go eat a few more! 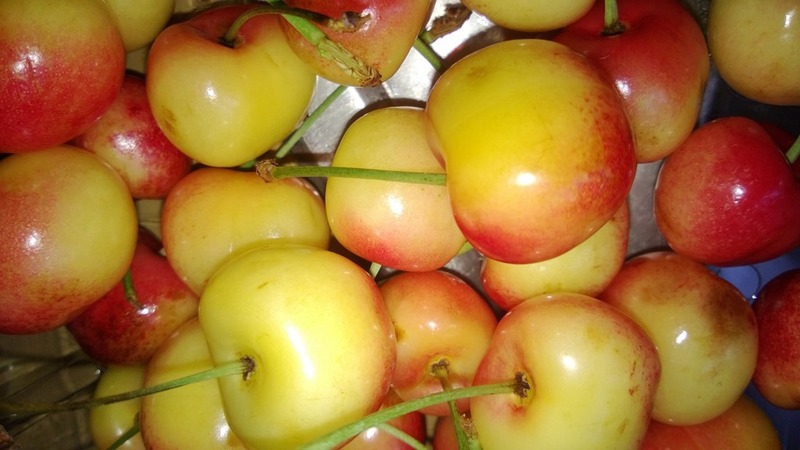 This entry was posted in Adventures, Food, Humor, Love and Marriage and tagged cherries, Friday Fragments, genetics, Kettle Corn, Rainier cherries, rolled tongue, Traverse City, Wenatchee. Bookmark the permalink. P.S. I love Rainier cherries! Pricey, yes. Delicious, yes!! Glad to see you finding your voice! I hadn’t thought about that, but it makes perfect sense. My whistling is pathetic! I think you should splurge at least once this summer! Thanks for the spitting euphemism. It does sound so much more lady-like. Of course I don’t know the demure way of saying you spit the cherry pit at Shaun’s cheek…but then I suppose it could take root in his beard. I LOVE rainier cherries! They’re the best! Rainer cherries are the best. I discovered them about 15 years ago and can’t get enough! I only wish I had discovered them that long ago! Secondly, thanks for joining FF’s – no invite necessary!!!! I hope you had such a good time of it you become a regular!!! So glad you’re on board for Friday Frags! Sometimes it’s the only post I manage to do in a week and it’s nice I can just throw random stuff from the week all together. I’ve never tried a Ranier cherry, but I will have to now. We’re going camping next week, so I hope to see some fruit stands along the way and I’ll look for them. Your cherry pit story reminded me of when me and my brother were young, riding in the back of the car, spitting pits at each other. I spit one right into his belly button! I’m pretty bad at spitting as well. I have been known to spit stuff on myself.